There are over a dozen major bag and case brands in the UK, each with their own design ethos. None are right, or wrong – in the end, once you’ve chosen the right type and size of bag for your needs, the rest comes down to personal taste. 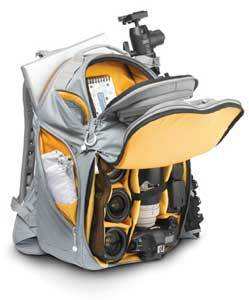 See our round up of the seven different types of camera bag. Here’s our guide to help you choose the best one for your needs. Top Camera bags are made from a variety of materials. Natural fibres (eg. canvas, cotton, leather) are favoured by the likes of Domke, Billingham, and National Geographic, while man-made hi-tech materials like ballistic nylon are preferred by brands such as Kata, LowePro, Tamrac and Crumpler. The latter generally offer higher performance – lighter, better water-resistance etc – but consider that traditional bags have survived use by Amazonian explorers and Vietnam war correspondents, so they should be able to cope with the odd downpour on the Peaks. The more padding a bag has, the more protection it offers, but the heavier and more rigid it becomes. Brands such as Kata are at the forefront of developing innovative workarounds such as aluminium ‘spines’. A bag’s water-resistance is very important. Look out for exposed zips that can let in water, or flaps that don’t offer a good seal. Some bags come with a waterproof cover, like a big shower cap, which you can pull over the bag if it rains.